Hey guys! So this is another upgrade I did from my last mani ('The couple'), talk about recycling! Lol. I loved the combination of the pink and blue, both very bright and bold, so I thought it would look great under a black crackle polish (Barry M Nail Effects). But the result is... meh... 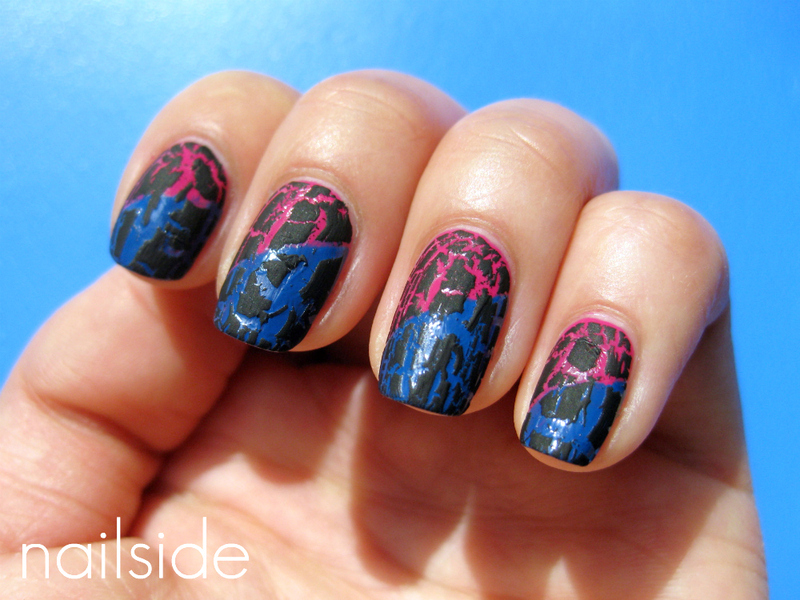 Somehow, the crackle made the whole very flat, less vibrant. I liked it better without. What do you guys think? i think some topcoat to make it all shiny would make it pop again! I agree with the ladies! And I still love it. I'm a sucker for crackle manis! Hi ladies! Thanks for the tip of adding topcoat, that did not cross my mind! Lol, so I had already removed it... But that's what I'll do next time. When I saw this I instantly died xD I love it so much. It's amazing what you think of. @Toyomi: *Smiles* Aww thank you!! I love crackle when it's matte!